His real name was Vernon Louis Gomez. He was born in Rodeo, CA. If he was still alive, today would be his 103rd birthday. He was part Irish and part Portuguese. His second nickname was “El Goofy” and if I was alive back in the thirties he would have been one of my favorite Yankees. Why? Because by all accounts, Lefty was not just one of the great pitchers of his day he was also the guy who kept the Yankee clubhouse loose. Yesterday I wrote about how Joe DiMaggio turned into a bitter man but that was only after Gomez retired and could no longer room with him or drink with him. Lefty forced DiMaggio not to take himself so darn seriously all the time. For example, he’d always tell reporters he made DiMaggio famous because nobody knew he could go back on a ball until he started playing behind me. Despite his sense of humor and his affinity for Manhattan’s nightlife, Lefty was an incredibly good pitcher. He was a four-time twenty game winner and he went a perfect 6-0 in the World Series. 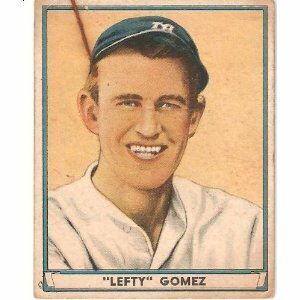 After hurting his arm in 1940, Gomez struggled through the final few years of his career and was coldly sold by the Yankee front office to the Boston Braves in January of 1943. His lifetime regular season record in pinstripes was 189 and 101 and included 28 shutouts. The Veterans Committee voted Lefty into the Hall of fame in 1972. He passed away in 1989, at the age of 80. Gomez shares his November 26th birthday with another former Yankee southpaw pitcher, this one-time Yankee reliever and this former Yankee right-hander.